Auto bagging is the process for sealing a specified amount of product in polybags. This process can be automatic, semi-automatic or manual. What are the advantages of auto bagging? Auto bagging is ideal for packaging small items for crafts, hobbies, hardware, electrical, furniture, school supplies and toy products. In auto bagging, individual parts can be secured easily within a product's packaging. Auto bags can include hang-holes which make them easy to sell; jpegging. Auto bags are very cost effective for high volume packaging. Auto bags come in just about any size and color, including preprinted styles. Auto bags come in many different materials. 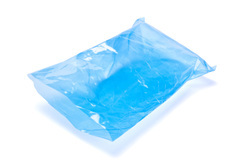 Auto bags come with different sealing features like zip-lock or fold-over tabs. Auto bags can have multiple cavities. Auto bags can be custom designed. Auto bags can be in large quantities, up to a million or more. Auto bags can be part of a complete turnkey service in which we will design, print, manufacture, fill, seal and set in display packaging ready-to-ship.